Once you get over the fact that trituration is a real word that means chew and grind to a fine powder you get to the reason why Green Star uses a triturating juicer instead of masticating juicer. Before we get to that, a basic anatomy and biology review helps to remember what the original and most natural juicers are. That is your teeth. Your teeth, by chewing, grind, no so much cut, the food especially fruits and vegetables. The grinding actions of chewing in the presence of natural enzymes in the mouth breaks down the cellular structure of the food and release the nutrients inside. Even if we ignore how little fruits and vegetables are part of our diets, most of us simply do not chew our food nearly as much as we should. Without chewing, the protective cellular structure of plants do not break down. These structures keep the nutrients locked in and they leave our bodies intact. Add to this other toxicity and digestive problems and you would know why most of us don’t feel so good. Green Star juice extractors invented and patented the Twin Gear technology to duplicate the grinding actions of the teeth in three stages. In stage one, it grabs and crushes. This is where pocket recess of each tooth comes in. The long fibers in vegetables like celery are cut into smaller pieces in this stage. The next stage is mixing. Everything is mixed together into a mush similar to what you would do if you were preparing prepare baby food. This is important if you are trying to juice soft fruits. Most centrifugal juicing machines have an easier time with hard vegetables like carrots because of their sharp blades cut pieces at high speed. Good luck trying to squeeze juice out of herbs or soft fruits like bananas or leafy greens like kale in a centrifugal juicer. Masticating juicer are much more for leafy greens but try soft fruits and it turns to a mush. 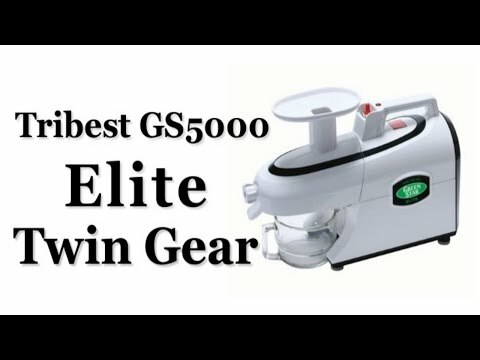 In this second stage of mixing before pressing, Green Star Twin Gear has increased their machines versatility and made it easier and more effective to juice soft fruits. In the third stage, the two gears press and push the mixture to squeeze every last drop of juice and nutrients out. Folks at Tribestlife have really gone through some amazing details in developing their product to ensure that your body actually gets the nutrients from your juicing efforts. They have added exclusive magnetic and bioceramic technology is an example of this. After your break down the structure of plants that keep the nutrients inside, these nutrients are free to interact with anything around. They can also attach themselves to the pulp and leave. The magnets within Green Star juicers are designed to rearrange water clusters and help them lock in place more of the valuable nutrients including vitamins and minerals within your juice. As the gears turn within the system, the bioceramic material uses the kinetic energy to emit far-infrared which naturally oscillates the water and all organic material which delays oxidation of your juice for up to 72 hours with a minimal nutritional loss. A pulp that goes through these stages is very dry which means you get more juice and have less waste. The juice also contains a maximum amount of nutrients that keep longer. There are the reasons why Green Star machines could easily be called complete juice extractors.